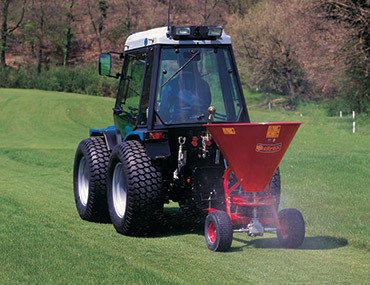 Spreaders for green areas and garden use. The FSP series spreaders are designed to be used on small tractors, garden vehicles and trucks, without P.T.O. shaft. These spreaders can be used for spreading fertilizers, sand or salt depending on the needs of users. The movement of the wheels through the gearbox, fitted on the main axle, makes the spreading disc turn. The forward speed determines the spreading width. By acting on the lever it is possible to increase or decrease the quantity of product to be spread. On request, this spreader can be supplied with a deflector for spreading salt or sand that allows spreading the product only below the hopper.